The EL25 is beautifully engineered for private residences and gated communities, yet fully adaptable for use in apartment buildings, condo complexes, office parks and commercial sites. Unmatched in its class, the EL25 is designed to easily manage between 1 and 25 occupants with a total of 250 access codes. And unlike other systems, the EL25 can be purchased as a standard unit without any unnecessary options. This lets you choose only the plug-in modules you need depending on the specifics of the job, and allows you to offer custom solutions right off the shelf without special orders. Available modules let you expand the system with complete control. An optional Wiegand module lets you add on card readers, prox readers and keypads to control up to four separate entrances around the property. 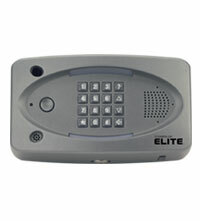 An optional RF module provides convenient access through gates or doors with Passport™ transmitters.